Most string trimmers are available with either a straight shaft or a curved shaft. The straight shaft style means that the shaft holding the trimmer head is perfectly straight. 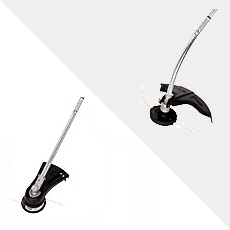 The curved shaft style means that there is a gentle curve in the shaft close to the trimmer head. When deciding which shaft style to purchase, you need to take into consideration a variety of factors, such as whether you are using it for professional or personal lawn care. Additional considerations are cost, weight, durability, and your own physical comfort requirements. 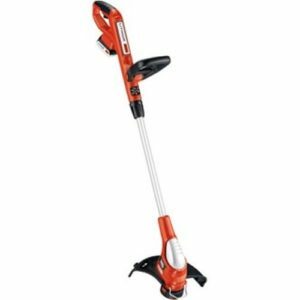 The Black & Decker LST220 cordless string trimmer and edger is powered by a 20 volt Max Lithium Ion battery that gives users more power and a lighter yard tool without the mess and hassle of gas powered trimmers. Gas, Electric, or Cordless String Trimmers? 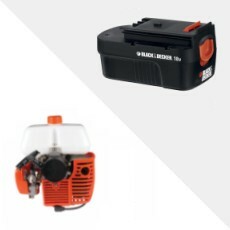 When you consider whether to buy a cordless, electric, or gas string trimmer, it can be confusing as to which might be the best one to meet your needs. Below are some tips and information that will help you to make the best selection for you and your yard. Electric string trimmers work off electricity and are used in the yard with an extension cord that allows for trimming at a moderate distance. These models are less expensive, and come in small, light sizes that are easy to carry and can be very quiet. These are best suited for smaller yards that have easy access to electrical outlets around the outside of the house. When considering buying one of these, you are limited to the length of extension cord that it is attached to. If you have a larger lawn, this can be a limiting feature. Keeping your yard and property looking well-maintained and professionally cut can take some extra work. One way to help cut down on how much work you have to put into it is to invest in a string trimmer. String trimmers are also known as weedeaters, weed wacker, line trimmers, and grass trimmers. They can help save you time and trouble when you go to work on your yard. Weedeaters are trimmers you use to get the weeds and other unwanted debris away that the lawn mower cannot reach. 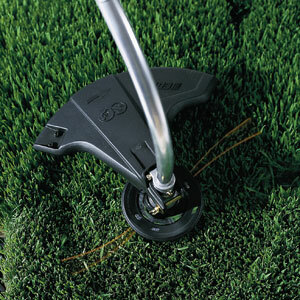 They use a flexible monofilament line rather than a blade to cut grass, weeds, and other plants. 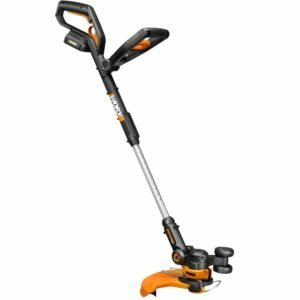 The Worx GT Cordless Edger and Trimmer has all of the features any lawn enthusiast could ever want in an edger/trimmer. It comes with a rechargeable 18-volt battery and a wall charger that can charge fully within an hour. And this is no ordinary rechargeable battery. It uses the Works Power Share Technology battery which lets you interchange it with any of the other Worx cordless tools.